India has reacted sharply to the latest human development report released by the undp, which recommends that developing nations should undertake mandatory emission cuts. "Any multilateral agreement without quantitative commitments from developing countries will lack credibility in terms of climate change mitigation," is one of the key conclusions of the report titled Fighting climate change: Human solidarity in a divided world. The report prescribes a 50 per cent global reduction in greenhouse gas emissions by 2050 compared to 1990 levels for a sustainable future. And to achieve this, it suggests, developed nations should cut their emissions by 80 per cent by 2050, of which 20-30 per cent cuts should happen by 2020. Then it goes on to suggest targets for developing nations, saying major emitters among the developing nations, after continuing in the business-as-usual mode till 2020, should aim at 20 per cent cuts by 2050.These suggestions have attracted criticism from the Indian government. While releasing the report at the undp office in New Delhi on November 27, the planning commission deputy chairperson, Montek Singh Ahluwalia, said the report did not address key issues of "equality and equity". 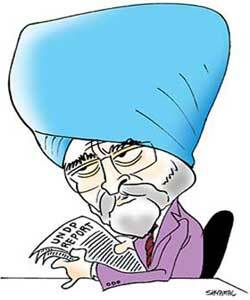 This was the first time a un report asked developing nations to take up commitments, said Ahluwalia. He also challenged the un research team to supplement their research. undp's India office, however, says the report's recommendation has been misinterpreted. "The report has been prepared using information from previous un publications and consulting with experts from various nations, including the chairman of the Intergovernmental Panel on Climate Change, Rajendra K Pachauri. It is for the countries to act on the recommendations," said Muna Haq of undp India 's communications division. Ricardo Fuentes, one of the key authors of the report also said in an e-mail that the report's conclusions have been misinterpreted and "we don't advocate quantitative reduction commitments by developing countries." The report is the latest in a series of reports published in recent months, putting pressure on India and China to adopt mandatory emission cuts.